Our team are experts in both transformational sustainability and sustainable procurement; we offer a range of support, which we know from experience will help you on your sustainable procurement journey. We continue to develop and innovate our approach to sustainability and sustainable procurement training for the sector. We have now moved to free webinar training for our tool users. The webinars can be completely bespoke either covering how to extract data from the dashboard, how to squeeze the best value from the tool or a specific application of the tool and data you would like some help with. We are still happy to deliver on-site training but there will be a cost for this. Technical changes to our system mean we are now able to create multiple dashboards for your university based around the different commodity codes (ProcHE). If you have category managers in place, for example looking at professional services, they would be able to view and interrogate all of the data from the Professional Services category (the dashboard would only show the data for suppliers in that category). This would enable category manager to more easily see category trends and understand the needs and priorities of those suppliers – this would greatly improve the opportunity to integrate the data into category strategies. If you interested in finding out more about having category dashboards created for your university get in touch. Working with your team we fundamentally review all of your procurement documentation and communication materials from three perspectives; internal stakeholder, procurement professionals and external stakeholder. We sit together over 2 days and review and embed sustainability into all documentation. This is a fundamental step in achieving Level 4 of the Flexible Framework, it is intense and challenging but once it is done sustainable procurement moves forward at pace. If you would like to speak to one of our previous clients contact us and we will put you in touch. Working with Stockholm Environment Institute we have been supporting the development of Research Reports based on the supplier data. 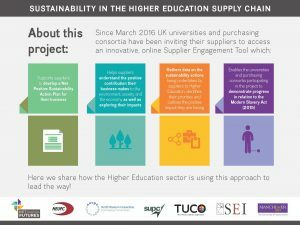 We have recently helped the University of Manchester to produce its own report demonstrating the impact of 1,000 of their suppliers engaging with the Tool. Each university has its own areas of interest and we are very happy to work with institutions to explore producing a report based on their own data and focus. We are able to produce a variety of infographics based on your dashboard data, which will illustrate the engagement with the tool and contribution of your suppliers to sustainability and social value. The data held within your Supplier Engagement Tool is comprehensive, however there is often a need to communicate the high-level messages to internal and external colleagues and stakeholders and infographics are effective wasy of achieving this. We can use your brand guidelines to produce an infographic for you using your university’s colours and logo – contact us if you are interested.